This museum has over 200 aircraft, all of which were used at one point or another by the Yugoslav Air Force. These include gliders, helicopters and jets. There are also relics of aircraft shot down during the NATO wars. An extensive video and picture collection takes you through the history of Yugoslav aviation. Check out the rad WWII collection. The building in which the museum is housed is a striking, geodesic structure – it looks like a giant mushroom, or a Tesla coil. Under 16 year olds must be accompanied by adults. Check out the souvenir shop and the cafe. The museum is 18km from the city centre. How popular is Museum Of Aviation? 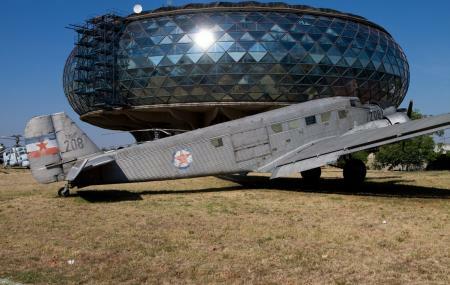 People normally club together Belgrade Military Museum and May 25 Museum while planning their visit to Museum Of Aviation. One of the biggest collection of historical aircrafts in the world. Amazing static display. The purpose built building could use some TLC but the airplanes always steal the show. If you are an aviation buff check it out if you are flying through Belgrade. Want to see one of the unique planes in the world, go to this museum. Guide was really good and speaks perfect English. Good place to visit in Belgrade especially if you have kids! It’s great piece of history, that unfortunately hasn’t been maintained properly. Still there is few interesting planes to see, definitely worth taking your kids at some point. I wouldn’t recommend visiting in the extreme hot temperatures since the air conditioning is not working, and there is more than few planes that are parked outdoor so one more reason to plan it at the right time of the year.